Been trying to do slightly more complicated scenes and getting characters into something other than a bad idle pose, and therefore tried to do a mockup of the original Legend of Zelda. Any feedback is much appreciated as I feel I'm still rusty when it comes to picking colours and making characters. Not a lot to say about this one, palette captured the original games pretty well. 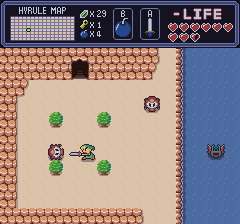 Link sprite is a little hard to read but I don't know what perspective you're going with here (top-down or side) so it's hard to give details. Will there be more mockups? Yeah I was going for one of those during-an-attack frames, which I think are naturally harder to read either way, though I'm really not experienced when it comes to characters and posing so it's relatively new grounds for me. I based his perspective on the original game, which has to convolute the perspective a bit for the sake of his side-movements. Because his overall sprite stays within a roughly 16x16 limit (His sword is a separate sprite in my mind), it was never going to be easy to replace the old mixed perspective. I've done other mockups like trying to make Zelda 2 look like it's on the original Gameboy, but I've not done other Zelda 1 mockups. Your policy is understandably correct: if it's a character or a monster it should contrast with the environment and thus should be outlined. It works well with the octoroks because their color is quite dark; works less with Link imo because of his lighter colors. Some light increase paired with a minor bump in the hue, I think it still works as an outline but blends in better? I kept the eye-area as the original outline colour though. 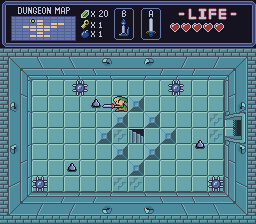 Did a 2nd mockup, this time with the dungeon. Re-used the original Link. Found it pretty difficult to do much with the fact that the dungeons are always based on a sole colour, but alas I tried. 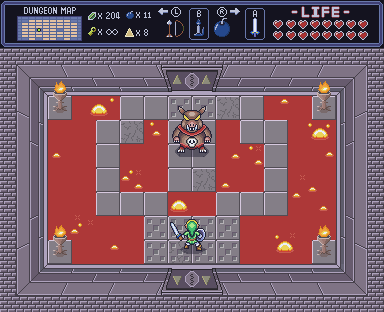 I was a few 16x16 tiles short of the proper resolution last mockup, and upped it accordingly too. The pyramidal blocks in the middle look a bit shallow, I think the illuminated faces should be as bright as the highlights on rims of the other tiles, if not brighter. Also, you are using the same middle color on the internal diagonals like they where an opaque 3d mesh defining the tappered shape of the blocks, but they are edges of a solid and should be highlighted on north and west like the rims of the rest of the tiles. Edit: I can also suggest that you could drop at least one shade on the hopscotch brick pattern, the internal shading inside each brick is barely visible, and it feels a little pillow shaded no? Digging the latest mockup. Good balance of NES and SNES-like (pretty sure it's closer to 16 bit spec). If you can't waste the colors here you can throw in 1 or 2 different tiles for cracked/old tiles or shading on the walls. That's gonna drag it past SNES-like territory and probably way off of Zelda graphics too so it depends whether you want to take this visual complexity all the way. That vis direction might be not what you are aiming for. yeah, it's not that I'm unable to afford the colours, I don't care what colours I use but more that I try to make good use of a limited amount for practise. The only time I completely disavowed that was with link who uses like 9 colours. Opted to simply go a bit crazy this time, upping tile-sizes to 24x24, tried a notably more complex character pose. I really had nothing to go on for Ganon other than BS-Zelda (Which I didn't really know about until recently), so I've struggled to pose him quite a bit, but otherwise I'm happy with this reimagining of the final fight of Zelda-1. Will put it in the base-post of the thread too.